The use of thermal analysis instruments in research and development of polymer materials as well as for quality assurance in polymer production and processing has increased enormously over the last few decades. Differential Scanning Calorimetry in particular has gained in popularity as the present DSC's make it possible to acquire, relatively simply and quickly, accurate information about phase transformations and thermal properties in relation to polymerization and molecular structure, processing and morphology, and article properties. This book provides the background needed for carrying out and interpreting the necessary measurements. It should be particularly useful for thermal analysts. Subjects discussed are: thermodynamics, calorimeters and how they work, experimental conditions, thermal characterization of states of matter, vitrification, crystallization, melting and dissolution, curing and coupled techniques. 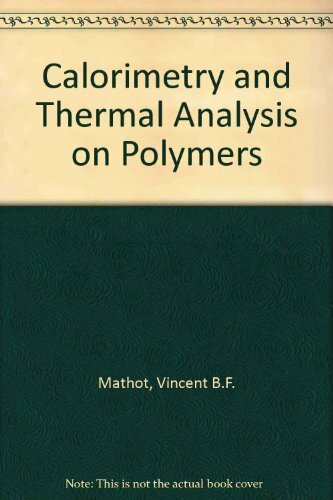 For the experienced thermal analyst, there is also detailed information about the quantitative use of DSC and various types of calorimetry.